The other week I spotted a recipe that immediately called to me. Okay, it didn’t just call to me. It screamed at me… ‘make me!’ And that’s just what I did. How often does that happen to you? It’s rare that I spot a recipe that calls to me so strongly I make it within the week. I have to admit, it’s probably only because it’s an apple pie and that is hands down my absolute favorite kind of pie. Usually I bookmark recipes for sometime down the road figuring I’ll eventually get to it when the time is right or the mood strikes me. I had to wait until it was grocery shopping day to pick up the apples. I wasn’t about to drag the kiddos out just to get apples when we clearly didn’t need them. This recipe is super easy. You could of course make it even easier by using premade pie crust. I won’t fault you at all for doing that. I know many people fear making pie simply because of the crust. Crust can definitely be hit or miss. There are so many recipes and probably just as many methods of making crust. In the future I’ll probably opt to use a different crust recipe for this pie. It tasted good especially with the added cinnamon but was just a little off texture wise. The apples didn’t disappoint. I was slightly fearful that they wouldn’t turn out based on what I’m used to with apple pies. So far I’d only made pies that call for cooking the apples prior to baking or baked with liquid within the pie. The method used for this particular pie is beyond easy. 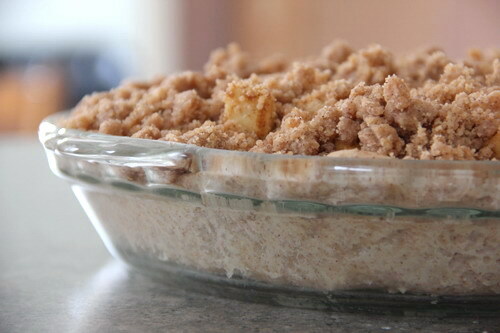 Basically you peel and chop up the apples, then toss in a cinnamon mixture. Because this is a crumb pie, it’s not meant to look perfect. Get the kids involved! They’ll love tossing the apples and adding them to the crust. Overall I’m happy I tried this recipe. It was super easy to make and the filling was extremely tasty. For a quick fix, I’ll definitely use the general idea of this in the future. In a food processor blend flour, sugar, salt and cold butter chunks. Blend until butter chunks are pea size or smaller. Begin adding 1 tbsp ice water at a time until you reach the consistency you are happy with. Form dough into a ball, wrap in plastic and chill for at least one hour. *Alternately you can mix everything together by hand with forks or a pastry blender. Preheat oven to 425 degrees. Prepare dry ingredients in a large bowl, set aside. Peel and roughly chop up apples into nice sized chunks. Transfer apple chunks into large bowl with dry ingredients. Top off with vanilla and lemon juice. Toss to coat apples well. Set aside for 10-15 minutes while you prep the dough. Roll out dough accordingly to fit your desired pie dish. My personal preference for rolling out pie dough is between two sheets of plastic wrap - no flour needed and no sticking to the counter! Easily peel off one side of the plastic wrap, flip into the pie dish, press and remove remaining plastic. Voila! Trim edges as needed. 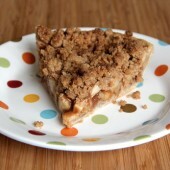 Fill pie crust with prepared apple chunks. In a medium bowl, combine dry ingredients. Pour cooled melted butter into bowl. Toss and cut until small to medium sized chunks form. Break up large chunks as needed. 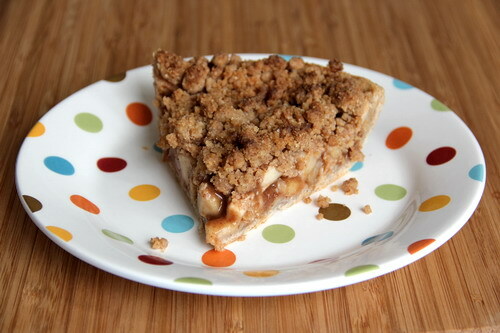 Using a spoon, sprinkle crumb topping over entire pie.